What bachelorette party would be complete without a cute little pink "pecker-shaped' cocktail shaker. The shaker is 8" tall and includes a removable cap and strainer. This Bachelorette Party favorite is all you need, just open the top, fill with your favorite beverage, shake, strain and serve. It also makes a great bachelorette party decoration and can be used with bachelorette party games. Every Bachelorette Party needs a bunch of fun bachelorette party games for all the girls to play, and this one is a cinch! 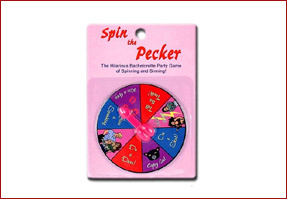 The 4" pecker spinner has a 'pecker' shaped spinner and then a host of dares. You can have the bachelorettes spin the dial and give dares to the Bride-to-be or pick another bridesmaid at the party to complete the dare. A bachelorette party favorite and easy to take with you wherever you go. If your bachelorette party is going to have some bachelorette party games, then you definitely need to have these bachelorette award ribbons to hand out to the best of the best. These mini award ribbons are a perfect addition to hand out at bachelorette parties. You can even have guys at the location be the judges, and award these cute little ribbons to the winners. Very easy to carry and pack. These bachelorette party award ribbons will be a great memory for the bridesmaids and friends who attend the last night out. 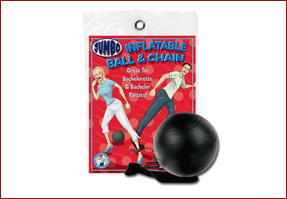 So your bride-to-be is tying the knot, and it's time for the bachelorette party, well we have a great attention getting accessory for the bride to be - an inflatable ball & chain! This is the perfect addition to the party outfit and one of the most popular supplies used by bachelorette parties around the globe! It is great because, unlike other ones, it is very small and light - easily transportable. It blows up to about 8" and is light and comfortable for the bachelorette to wear. Just watch the looks she will get when you and the bachelorettes are out on the town or at a bar or restaurant! Cute little pink bachelorette party pecker decorations are sure to complete any bachelorette party table. Each of these darling table decorations are about 6" tall and have a fold out 'ball' shaped base and use a pink colored fold out paper to support the decoration. 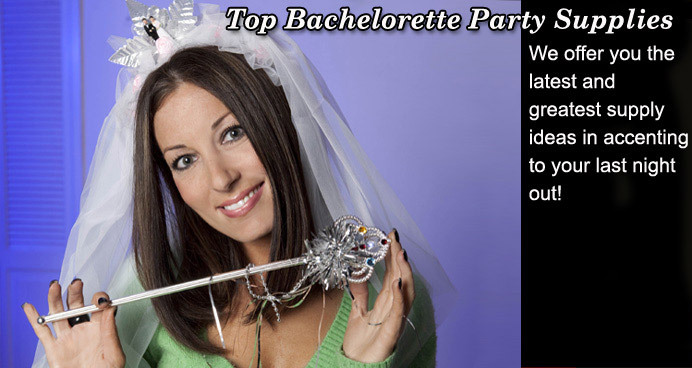 Get a few of these great bachelorette party decorations to add to your next 'girls night out'. This is one of the most popular new products of bachelorette parties around the globe! Easy to carry and great to use as decorations wherever you go! These are a great addition to all bachelorette parties. These are those same noisemakers you see at football and basketball games but special for bachelorette parties. Each package comes with two inflatable blow up sticks with a cute pink Willie on each one. Blow them both up and then bang them together to make noise or use them to bang on unsuspecting boys. They make great bachelorette party decorations besides being use for bachelorette party games. Easy to carry and travel with!